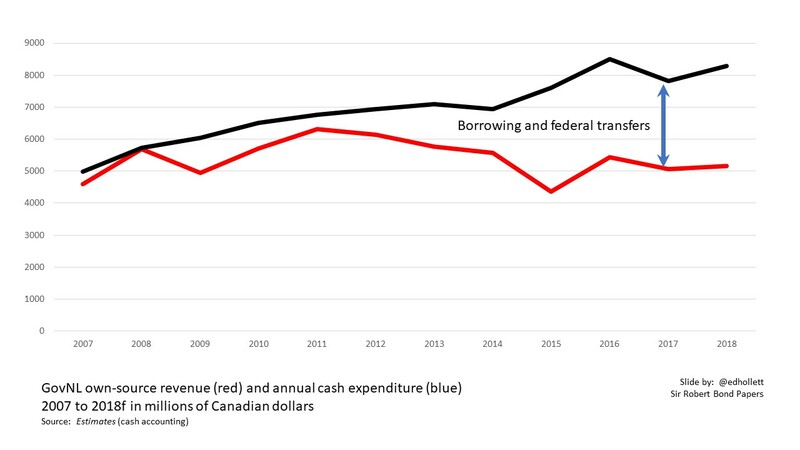 Spending versus Income - The chart shows cash spending (black) compared to own-source revenue (red). 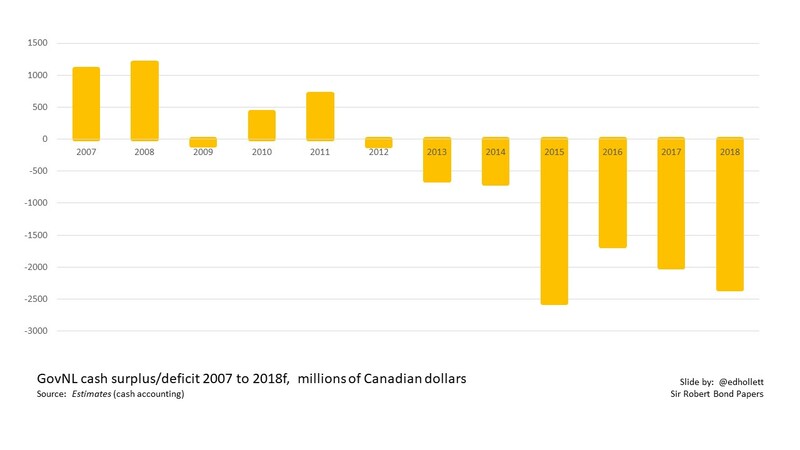 The provincial government covered the gap between the two lines with borrowing, federal transfers, or a combination of both. The forecast in 2018 for the new budget showed an increase in the gap as government spending increased while income stayed roughly the same as 2017. It will be interesting to see what the actual 2018 performance looked like and what the 2019 forecast shows. Did the gap get wider or did it narrow? Surplus/Deficit - Budget 2018 forecast a larger cash deficit than in either of the two prior years. That's not a good trend. 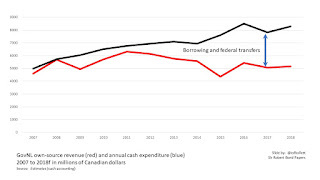 The more cash borrowed - either short-term or long-term - the more debt the provincial government accumulates. The more debt, the more money that has to go to pay the interest on the debt. The more money that goes to servicing the debt, the less money there is for everything else. That's on a cash basis. 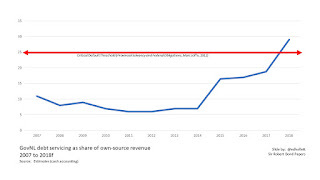 Using accrual accounting, the trend is still upward but we are not at the crisis point yet. Dependence or Vulnerability - This isn't a common way to measure a government's financial vulnerability but it is very useful. Alberta economist Trevor Tombe uses this comparison of natural resource revenues and deficit as a share of spending to describe the extent to which a government is dependent on non-renewable resource revenues. That dependence is a form of vulnerability since the the price of oil is volatile. 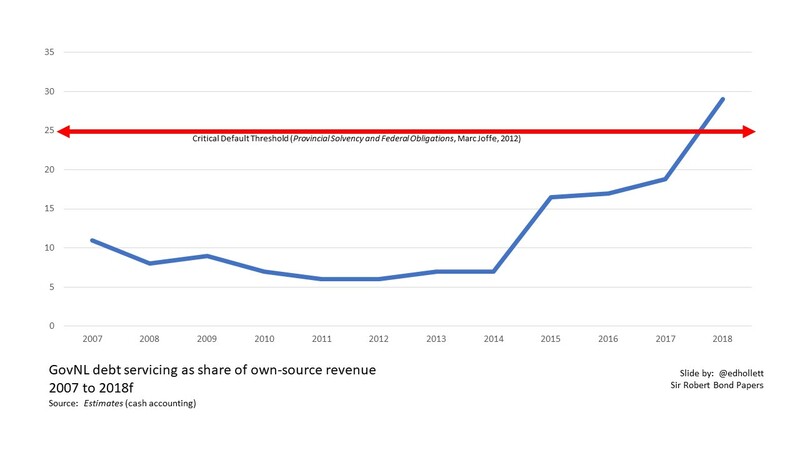 By this measure, Newfoundland and Labrador's budget has a pronounced dependence on oil. 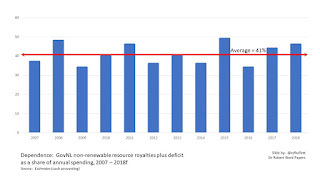 Of the 12 years shown in the chart, oil and deficits were higher than 40% of spending in seven of them.